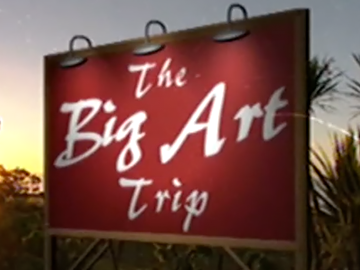 The Big Art Trip was a TVNZ arts series that took the form of a road trip around New Zealand visiting artists in their homes or studios. The series featured two presenters — design writer and art historian Douglas Lloyd Jenkins teamed with screenwriter Nick Ward in the first series, and with musician Fiona McDonald in the second. Ward and McDonald were very much the neophytes — the everyperson asking questions on behalf of the audience that allowed Lloyd Jenkins to background, contextualize and explain what was being seen, heard and experienced. Nick Ward is a prolific and award-winning screenwriter. He attracted notice with the hit feature film Stickmen, a Wellington lads-on-the-make tale that potted him the best script gong in the 2001 New Zealand Film and TV Awards. He originated, and then co-wrote, popular recycling relationship comedy Second-Hand Wedding (2008); and wrote the original script for Love Birds (2011). His TV screenwriting credits include Outrageous Fortune, Burying Brian, Nothing Trivial and The Cult. Ward has also worked in front of the camera, co-presenting The Big Art Trip with Douglas Lloyd Jenkins. The final episode in Series One of The Big Art Trip starts in Dunedin. Hosts Douglas Lloyd-Jenkins and Nick Ward explore found art and ceramic sculptures with artist Jim Cooper and visit jewellery artists Ann Culy and Rainer Beneke, before heading to the Kaka Point home of poet Hone Tuwhare (where he lived until his death in 2008). They head to Invercargill to meet classical singer Deborah Wai Kapohe, who takes them op-shopping and performs her original folk songs. Last stop is Cosy Nook in Southland where they meet painter Nigel Brown.